Teach Us to Sit Still is the visceral, thought-provoking, and inexplicably entertaining story of how Tim Parks found himself in serious pain, how doctors failed to help, and the quest he took to find his own way out. anticipated finding answers; he was about as far from New Age as you can get. an intellectual and writer. He is drawn to consider the effects of illness on the work of other writers, the role of religion in shaping our sense of self, and the influence of sports and art on our attitudes toward health and well-being. Most of us will fall ill at some point; few will describe that journey with the same verve, insight, and radiant intelligence as Tim Parks. 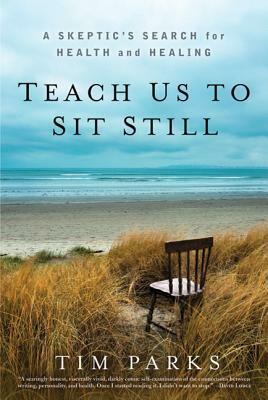 Captivating and inspiring, Teach Us to Sit Still is an intensely personal—and brutally honest—story for our times. TIM PARKS is the author of novels, nonfiction, and essays. He has won the Somerset Maugham, Betty Trask, and Llewellyn Rhys awards and been shortlisted for the Man Booker Prize. His works include Destiny, Europa, Dreams of Rivers and Seas, Italian Neighbors, An Italian Education, and A Season with Verona.